The Canadian Scottish Regimental Association is a group of former members of the regiment who have retired or left for other reasons. They meet regularly in the Victoria and Nanaimo armouries, as well as at an annual reunion being held at a different city each year. They have over 500 members located across Canada, the USA, England, Scotland, The Netherlands, France and Belgium. The purpose of the association is to support the regiment and its troops in various ways. The dedicated volunteer members organize fund raisers and distribute the money raised among the C Scot R Cadet Corps and the troops of the regiment. They send packages to those serving overseas and give out student bursaries and scholarships. The Association also has their own band, and often they play along the Regimental Band to support military events and functions. They visit sick or injured members and send gifts, flowers and cards. They are the "grandparents" of the Regiment whom are always there to lend a helping hand if needed or offer valuable advice when required. The Regimental Association is a fundamental anchor to the regiment's way of upholding their heritage and traditions, as well as keeping the "family" together, especially during tough times. Without them, things would not be the same. The Regiment is forever grateful for their continued dedication, support and encouragement. Towards the end of World War I and shortly after, Branches of the 16th Battalion (The Canadian Scottish) C.E.F. Association were formed in Vancouver, British Columbia; Moose Jaw, Saskatchewan; Winnipeg, Manitoba and Hamilton Ontario. The object of the association were to perpetuate the name and traditions of the 16th Battalion C.E.F. These locations held annual reunion dinners into the 1960's and early 1970's before being disbanded because of dwindling membership. In 1938 some former members of the 16th Battalion living in Victoria received a letter was from the Vancouver Branch inviting them to open a Victoria Branch. Discussions took place to consider forming such an organization strictly as a 16th Battalion Branch or as a Canadian Scottish Association along the lines of the British Regimental Associations. The latter would include members of the reserve battalions of the 16th as well as current and past members of The Canadian Scottish Regiment. After several meetings of the organizing committee and approval from Ottawa the 16th Battalion (The Canadian Scottish) C.E.F. Association, Victoria Branch was formed with membership confined to ex members of the 16th Battalion C.E.F. One of the first objectives of the newly formed Branch was the erection of the Cross in memory of fallen comrades. A cross taken from the battlefield at Vimy Ridge was placed in Pioneer Square and a church parade of The Canadian Scottish was arranged to hold a Cross Dedication Ceremony on October 23, 1938. 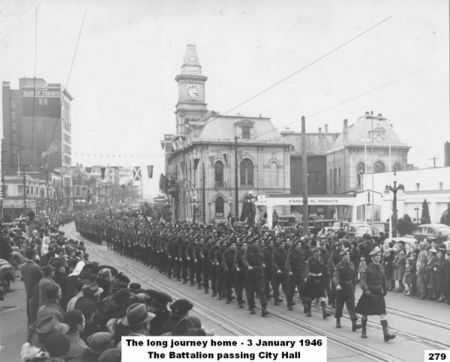 On October 26, 1940 at an Annual General Meeting it was decided, with support from all but one of the other Branches (which had not had a meeting to discuss the matter) that the Victoria Branch be permitted to include past and serving members of The Canadian Scottish Regiment, since the bulk of the Regiment was in Victoria. 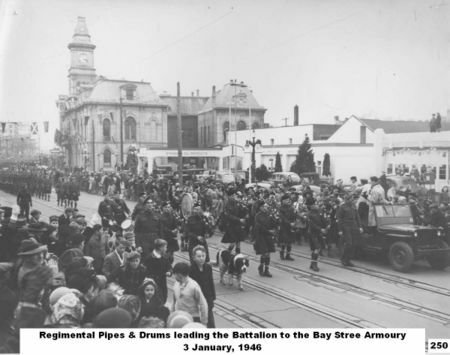 On April 17, 1943 at a General Meeting held in the Sergeants' Mess in Bay Street Armoury a motion was passed that the name be changed to The Canadian Scottish Regimental Association. At the next meeting Colonel H.M. Urquhart spoke fully on the future work of the Association, stressing particularly that arrangements should be made for the proper care of the 16th C.E.F. Memorial, and that the Regimental Trustees would take care of the cost of any improvements. There was also a discussion about registering the Association under the British Columbia Societies Act. A committee was appointed and after some investigation and several meetings it was later felt that there would be no advantage. A By-Law committee was also established. On April 19th, 1944 at the Annual Meeting the proposed bylaws were presented in three parts: the name, the objectives and the bylaws. These were all passed and formed the first Constitution of the Association. During the latter part of the 1940's the Victoria Branch worked closely with, and sent donations to, the Vancouver Branch which was looking after wounded men of The Canadian Scottish Regiment recovering at Shaughnessy Hospital in Vancouver. In 1947 local members took direct responsibility when the new Department of Veterans Affairs Hospital was opened in Victoria. Four members had already been transferred from Shaughnessy Hospital and would be arriving in the coming days. The Victoria Branch also supported the Regimental Rugby and Soccer Teams and the Garrison Badminton Club. Annual Reunions and Dinners were held at various times. Much time was spent on looking at raising funds for the erection or acquisition of a Memorial Club House since there were no rooms available in the Armoury. Two properties were of interest but the project failed for want of financing. There were discussions also about placing a plaque in the entrance to the Armoury opposite that of the Royal Canadian Artillery. There were also discussions about mounting a plaque in memory of the fallen of the Canadian Scottish Regiment in World War II on the memorial cross at Pioneer Square. These discussions led to the idea of erecting a new cross at Pioneer Square in memory of the Scottish dead of both world wars. This would be of stone and the base of the cross would be engraved: the one half to the memory of 16th Canadian Scottish soldiers who had fallen in World War I and the other half in memory of fallen comrades of The Canadian Scottish, 1939-1945. In the meantime it was evident that the existing cross had to be repaired and that a plastic spray should be used to preserve the wooden cross which was weathering badly. In earnest of Col Urquhart's pronouncement years before, the Trustees were approached to share the cost of repairs. The new cross was erected in 1951 and the original Vimy Cross was moved to the Bay Street Armoury to be instated in a display case at the east end. Interest was also expressed in producing a Regimental History, but the members decided the matter should be left until the Association was better informed on the question of Regimental Funds presently held in trust. In the 1950's, meetings were reduced to one per quarter due to the waning interest in the Association. At one time it was suggested that the activities of the Association be discontinued for some time so that a large reunion would have more appeal. However a small group determined they would keep the Association alive and ensured that an Annual General Meeting would be held each year on the 1st Saturday in March. The Association was approached about allowing members of the Canadian Scottish Ex-Cadet Association, since they were already members of the Canadian Scottish Regimental Family, to become members of the Canadian Scottish Regimental Association. The Regimental Association agreed, perceiving an infusion of new members. On 16 June 1962, during the visit of Her Royal Highness, The Princess Royal, the Association was honoured as Princess Mary laid a wreath at Pioneer Square, inspected veterans and took the salute on the march past. In 1963 the Association adopted the glengarry and Regimental cap badge as its official headdress and appointed Capt, the Reverend J. McLean, D.D., who had long been the Regimental Padre, as Padre to the Association. Meanwhile the Association was expanding geographically. An independent branch was formed in the interior of British Columbia in the early 1960's, with representatives in cities such as Cranbrook, Creston, Hope, Kamloops, Kelowna, Osoyoos, Penticton, Revelstoke, Summerland and Vernon. The first interior reunion was held in Cranbrook in 1963, with subsequent reunions being held in all of those cities. In 1974 the reunion took a truly Provincial flavour when it was moved from the interior for the first time to be held in Victoria. Later years have seen these reunions, which have become the major function of the Association, held annually and moved around - even to Calgary and Leduc in Alberta. Because of dwindling memberships in the B.C. interior cities a great deal of the reunion support work is now done with the use of modern communications technology from Victoria. Computer technology has been of tremendous benefit in the past two decades. It has permitted an easily maintained database of former and current members of the Regiments so that mailing lists are quickly modified. Moreover, it allows for the generation of the Association's quarterly newsletter, The Can Scot. Launched originally to take the place of The Brazier, whose sporadic editions were printed first by the 16th Association and then by the Regiment, The Can Scot is published quarterly and has played a vital role in apprising over 500 members of the Regimental Family's activities and in helping to connect individuals throughout Canada, the USA and Europe. In 1987 (the same year that the Association's Constitution and Bylaws were finally registered under the BC Societies Act) an official Branch of the Association was formed in Nanaimo BC. The Branch continues to be strong and works very closely with the Regimental Association in Victoria in most of their projects. Their major fundraiser has been a pancake breakfast cooked for the two days of the world famous "Nanaimo Bathtub Race" held in July of each year. They have also been strong supporters of "B" Company located in Nanaimo and the affiliated up-island Cadet Corps. Tours to the battlefields of Normandy and Holland have also been a major interest of the Association. The first was conducted in 1969 to commemorate the 25th Anniversary of D-Day. A trip to Normandy was organized in 1979, another to both Normandy and Holland in 1994 for the 50th Anniversary of D-Day, and a further in 2000 to Normandy, Belgium and Holland for the 55th Anniversary of VE Day. During the 1994 trip, a 1st Battalion Canadian Scottish Memorial was unveiled in Putot-en-Besin, and during the 2000 trip a bronze plaque honouring the 16th Battalion C.E.F. was presented to the St. George Memorial Church in Ypres, Belgium. The Association also played an important part in the visits of the Colonel-in Chief, Her Royal Highness, Princess Alexandra in 1979 and in 1989 for the 75th Anniversary Celebrations of the Regiment. More significantly the Association has continued to make its presence felt as a major supporter of the Regimental Family. The Association members are out in force every Remembrance Day ans serve the All Ranks Christmas Dinner. They provide workers, guides and security for the Regimental Museum and for the annual Regimental Ceilidhs. Their involvement in raising funds for the Regiment by encouraging donations to the Endowment Fund and the Book of Memory is exemplary. Most recently the Association along with the Women's Auxillary has provided "packages from home" for the Regiment's soldiers in overseas theatres. This has been as important to those troops as it was to their predecessors in previous deployments. The presence of the Regimental Association has been and is vital to the continuation of Regimental tradition and support. By the Mid-1980’s quite a few members of the Regimental Pipes and Drums were reaching, or had reached, the Canadian Forces’ compulsory retirement age, but continued to parade with the band nevertheless. Concerns were raised however, about the liability of the Department of National Defence should anything untoward happen to these musicians while training or performing with the band. 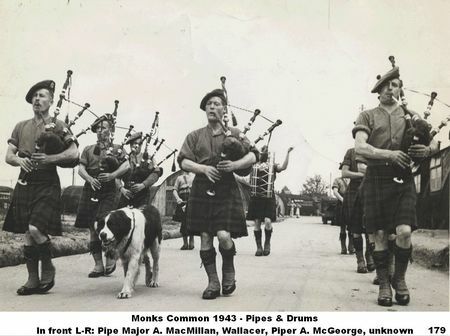 To overcome the dilemma of needing the experience and presence of these veterans, but facing a ban on their performing with the band, the Association was approached to sponsor a pipe band and undertake the responsibilities concerning liability, uniforms and other pertinent issues. Thus the Regimental Association Pipe Band was formed in 1988. Often the backbone of the Regimental Pipes and Drums over the years when Canadian Forces’ policies concerning bands were in constant flux, the Association Band could also be found performing as a separate entity in parades, at Regimental Ceilidhs and at other venues where they could they could raise funds to support themselves. Annually they have entertained the veterans in hospital and in Royal Canadian Legions on November the 11th, and have marched in the 1st of July Canada Day Parades in Sidney. With the great appreciation of the students, moreover, they have continued to bring along young pipers and drummers, especially in the Cadet Corps. The contribution of the Regimental Pipes and Drums is inestimable.